Download a copy of the actual promotional sheet (above). The text (right) is what is used on the sheet. Please feel free to model your materials after this example. These sheets are being distributed to MDs / physio clinics in my community, with a referral sheet. 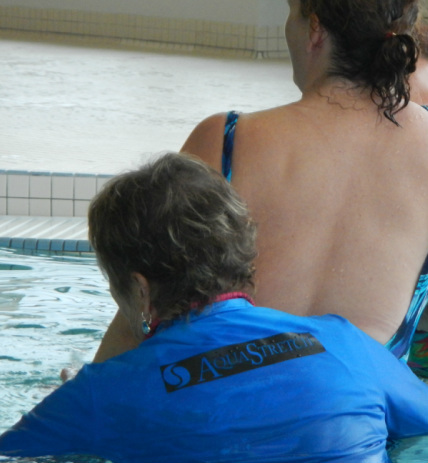 AquaStretch™ is a unique form of hands-on, facilitated myofascial release performed in warm water. AquaStretch™ is clinically proven to restore mobility, decrease pain, facilitate exercise comfort and efficiency. AquaStretch™ uses buoyancy, weighted resistance, and prescribed methodology to produce outstanding results, from athletic performance to rehabilitation. AquaStretch™, in combination with aquatic exercise and land-based therapies, is an ideal fit for many patients. Connie Jasinskas (M.Sc., Certified Exercise Physiologist) has provided therapeutic aquatic exercise in Cambridge since 2002, and AquaStretch™ since 2010. She is an international trainer in aquatic rehabilitation and AquaStretch™. Please contact Connie Jasinskas for more information. They keep you warm and comfortable while doing AquaStretch™. They create a professional presence, telling on-lookers what you are doing. They are a divider between you and your Client, creating a professional distance for those up-close AquaStretch™ Procedures and Technique. To order jackets or shorts branded with the AquaStretch™ Logo, click on the logo below or the picture, left. This little plastic step-stool was found at a discount store. It is all plastic - so no rust. It sinks to the bottom of the pool but can be easily fished up with your foot. It folds flat for easy storage. It costs from $6 - $12, depending on where you find it. The one I have been using is over a year old, with no signs of wear. It works well for COPS and Trap Tap, since it affords the Facilitator a height advantage. As a shorter Facilitator working in relatively deep water, my body weight can be levered forward to create better downward pressure with less stress on my shoulders, upper extremities or back. These resources are excellent accompaniments to AquaStretch™ Training. The Trigger Point Therapy Workbook has excellent visuals to show trigger point sites and consequent referred pain. It is user-friendly for the average reader. The Theracane is ideal for self-release of myofascial adhesions using AquaStretch™ Technique.